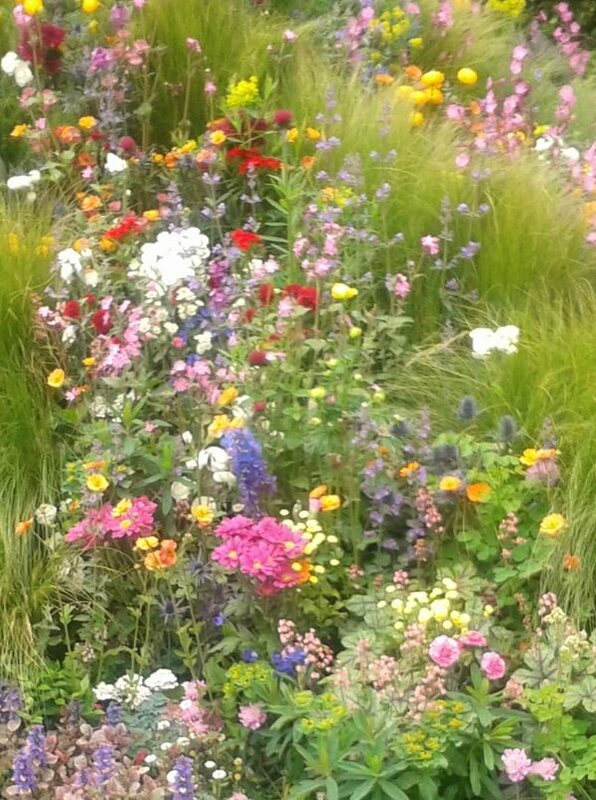 Several of this year’s big flower shows have included gardens entitled something like The Wellbeing Gaarden. This is not really surprising with the increasing realisation that gardens and gardening can be very good for our mental as well as physical health. What does surprise me though is the apparent consensus from the shows, magazines and TV, that to be good for your wellbeing a garden has to be a place for quiet contemplation populated with white and blue flowers and the ubiquitous soft foliage as a nod to a sensory experience. As I wrote last month a calm, mindful corner of your green space is definitely of value but this is only one of the ways that we enjoy and benefit from our gardens. Whilst some people appreciate a sanctuary from a busy everyday life and worries, others want to be uplifted by bright colours and bold planting. A key plank in good mental health is a sense of self-worth, that we can succeed in what we chose to do and contribute to family, community or society. We each find our own method for this and gardening is just one way. So an allotment may also be a ‘wellbeing garden’ for the person who gets a sense of achievement from sowing seeds to produce fresh vegetables for family and friends. I have long believed that every garden is a Wellbeing Garden whatever it looks like as long as it meets the needs of the people who live there. 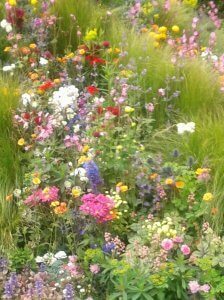 If your garden frustrates or depresses you then you have the wrong stuff in it or maybe you would love it if you were confident in looking after it. If there are tasks that you dislike, it can help to look at the positive side: weeding is a good example. Often seen as a chore but think of it as creating space for your chosen plants to grow, reducing competition, part of the nurturing process. Looked at with a positive slant, even maintaining a lawn that is used as a football pitch where you would personally prefer a herbaceous border, has its reward when you see children happily playing outside. Society knows that access to green spaces and connection with nature are vital for human beings, young and old alike. You deserve a garden that meets your desire for peace, joy, inspiration, success or carrots – your very own Wellbeing Garden with or without that wafty foliage.